Every year, 22 million American homeowners hire lawn care professionals to tend to their yards. That's because a well-maintained yard is the easiest way to make your home more attractive. But before you go out and give your hard-earned money to a landscaper, you should consider taking the work in-house. If you follow these 6 tips, your yard can be the envy of the neighborhood for a fraction of the cost. Typically, lawns will need a little extra nutrition than what they get just from Mother Nature. That's where fertilizer comes into play, often in the form of solid pellets that can be applied with a lawn spreader. It's no secret, professional landscapers use fertilizers to make grass healthier and lusher. Nitrogen is the most important nutrient for grass because it helps it grow faster and be greener. We always recommend using an organic fertilizer because it won't put any harmful chemicals around your house. This is especially imperative if you compost items from around your lawn. The fertilizer will put more nutrients into your soil and grass, but to make sure your lawn stays green, you'll still need to water it. Sure, in the heart of the summer it can be nearly impossible to prevent your lawn from drying up, but watering it is the biggest factor in keeping your grass green. 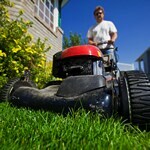 Mowing your grass properly is going to be the crux of a well-maintained lawn. You need to make sure the mower blade is sharp, so it cuts the grass, as opposed to ripping it. Part of this is also not cutting too much at once. You want to mow about 1/2" at a time. Like a farmer rotating crops, you should mow horizontally one time and vertically the next. This will cause the grass to grow straighter. Make sure you never mow when your grass is wet. It doesn't matter if it's wet from rain or dew, the grass will mat and leave clumps on your yard. Those clumps can then smother the grass beneath them, leaving unsightly dead spots. If you need help choosing a new mower, read our Lawn Mower Buyer's Guide. One thing that really separates the veterans from the rookies is edging and trimming. This is what will give your yard the professionally-manicured look people pay so much for. Mowers can only get in so close around objects like trees, fences, flower beds, etc. To finish the job, use a string trimmer around the base of trees and fences. Edging around flower beds and gardens markedly improves the aesthetic appeal of your yard. 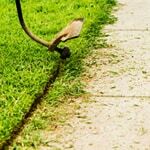 You can do it rather easily with a gas-powered edger, or you can go old-school and just use a shovel. Mulching is important to your landscape for several reasons. It reduces both surface evaporation and soil erosion. Mulching helps shallow-root plants avoid frost and freeze damage. Mulch also encourages weed control. In addition, as the mulch decomposes over time, it releases nutrients into the soil. This is especially important in landscaped areas because all the other dead plants that would normally supply these nutrients have been removed. 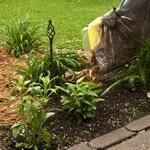 This is a great way to get rid of natural waste from throughout your yard and home. Composting is the purposeful decomposition of organic materials, which can be used as soil enhancers or a natural fertilizer for your gardens. 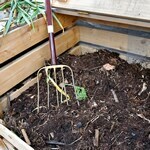 You'll want to put lots of grass, leaves and dead plants in the compost pile. Also, materials from inside your home, like banana peels and eggshells are great for the pile. After you've let it cook, distribute it around your lawn and gardens. It will slowly release nutrients into the soil, making your yard healthier and more conducive to growth. 6 Tips For Easy Landscaping.. Our Power Equipment Direct how-to library can help you learn about How to Fertilize Your Lawn, Vote for Your Favorite Brands in Mower Madness 2019 and Official Mower Madness Contest Rules.